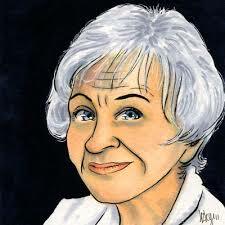 We’re looking this week at Alice Munro’s four autobiographical stories that close the Dear Life collection. Yesterday, we talked about how she has a penchant for layering her stories with several different themes, plots, and connections. Well, in today’s feature, “Voices,” she does this in an almost linear fashion. The story meanders around for awhile through different topics and ideas, leaving the reader wondering which thread will be picked up as a main theme. We wait and wait and are surprised finally – or at least I was surprised – when the story shines a spotlight on a seemingly tangential scene in which a young Alice sees a woman crying, being comforted by a few men at a party. The focus on this scene seems to surprise Munro too, for she goes back to it analyzing why exactly it stands out in her memory. What was it about this woman who caught her imagination? She spends the last two pages of the story considering this, working through the analysis for the reader. It’s almost as if her memories are the story, and she then analyzes the story for us just as a reader would. So it wasn’t Peggy I was interested in, not her tears, her crumpled looks. She reminded me too much of myself. It was her comforters I was marvelled at. How they seemed to bow down and declare themselves in front of her. What had they been saying? Nothing in particular. All right, they said. It’s all right, Peggy, they said. Now, Peggy. All right. All right. Such kindness. That anybody could be so kind.